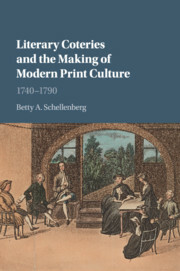 Literary Coteries and the Making of Modern Print Culture offers the first study of manuscript-producing coteries as an integral element of eighteenth-century Britain's literary culture. As a corrective to literary histories assuming that the dominance of print meant the demise of a vital scribal culture, the book profiles four interrelated and influential coteries, focusing on each group's deployment of traditional scribal practices, on key individuals who served as bridges between networks, and on the aesthetic and cultural work performed by the group. The book also explores points of intersection between coteries and the print trade, whether in the form of individuals who straddled the two cultures; publishing events in which the two media regimes collaborated or came into conflict; literary conventions adapted from manuscript practice to serve the ends of print; or simply poetry hand-copied from magazines. Together, these instances demonstrate how scribal modes shaped modern literary production. This title is also available as Open Access. Betty A. Schellenberg is Professor of English at Simon Fraser University, British Columbia, where she is a founding member of the Print Culture group and winner of a Dean's Medal for Excellence. 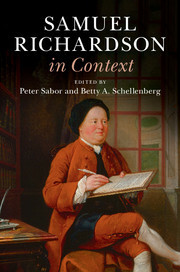 She has edited, for The Cambridge Edition of the Correspondence of Samuel Richardson, the volume Correspondence Primarily on Sir Charles Grandison (1750–1754), which appeared in 2014. 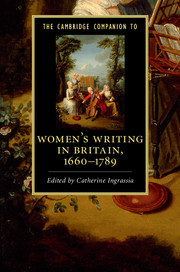 Her other books are The Professionalization of Women Writers in Eighteenth-Century Britain (Cambridge, 2005), Reconsidering the Bluestockings (2003, co-edited with Nicole Pohl), Part Two: Reflections on the Sequel (1996, co-edited with Paul Budra) and The Conversational Circle: Rereading the English Novel, 1740–1775 (1998).